This stunning Silver Fox Full Fur Russian hat is a classic style using the finest grade of fur pelts. Our Russian style hat is made with genuine Fox Fur including the ear flaps with leather ties. The ear flaps can be worn down for extra warmth and style or neatly folded up and tied at the top. The interior is quilt-lined for extra comfort. Fox Fur is one of the finest furs available, making it ideal for winter hats. "I recently purchased both the silver fox and coyote Ushanka full fur hats, and couldn't be more pleased with both. They not only are very practical and functional in design in providing full warmth for my head, but they are spectacular in appearance. I chose these two as a match for the silver fox to go with my black coat and coyote to go not only with brown but black jackets as well. For the well below freezing temperatures we experience even in Virginia, I wouldnt have any other head cover. 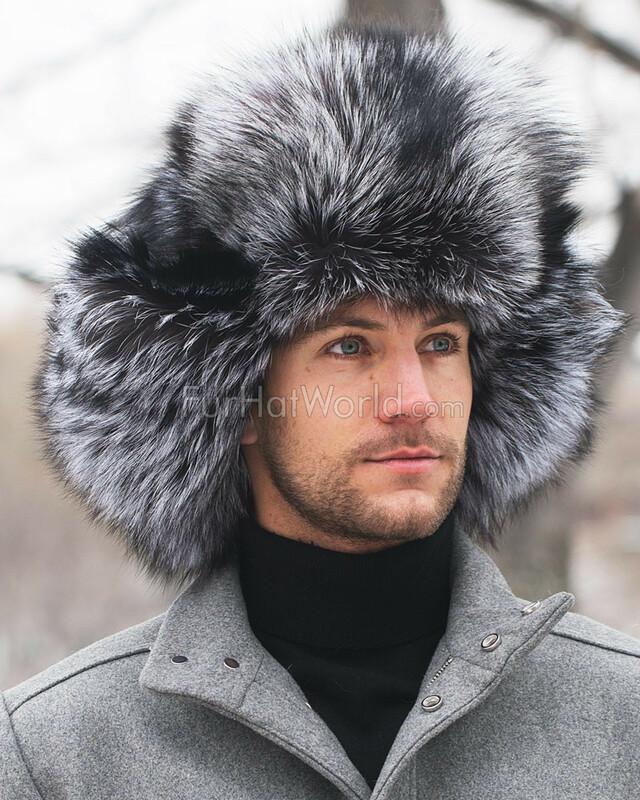 Compared to other outlets for Ushankas, I have found that Fur Hat World takes meticulous care in quality and craftsmanship with their Ushanka hats, which makes them all the more enjoyable -- and essential in an outdoor winter wardrobe. Michael Reston, Virginia"
"I have just received this hat. (my 4th) All are well crafted, warm, great fit. The compliments I recieve everywhere I wear it are wonderful. Really warm on the cold NH days. Hats are beautiful. The company is very customer orientated, delievery is pretty quick, and when I have had questions they have the right answers." "This Fur Hat is BIG and BEAUTIFUL! Silver Fox is the most gorgeous fur that I have ever seen. This is the 3rd hat I have purchased from FHW. I have the Silver Fox Trooper which is also such a gorgeous hat, that I had to pull the trigger and buy the full version. I also own the full beaver. Now its a struggle to decide which hat to wear for what? I love them all! FHW products are so nice they become an addiction...."
"I got this in January of 2016 we have just had some record setting temperatures 27 below zero with a wind chill of 50 below this hat has kept me warm not just good looking but wow does it performs"
"The silver fox full fur hat is the most beautiful hat that I have ever worn. I've been given at least 1 complaint everyday! It's a huge hat, but super warm. The fit is spot on. The bright silver sure gets a lot of attention. I love everything about this hat. Worth the $ as well. Just remember to don't get it wet! I'm gonna be keeping this for a while." "This hat is beyond what you can imagine. it is so well hand crafted. the colors and fur quality are top notch. I was a little nervous spending this kind of money on a hat, but I will say I am very happy. money well spent for such a quality hat... Thank you!" "Great shopping experience. The hat was great and delivery was easy and fast. Thank you for your service. Nataliya"
"Great gift. Warm. Sorry it can't be worn year round. May relocate to colder climate.????"